We are trusted by universities, organizations, conferences, and students. Online proofs show exactly how your poster will look when printed. Amazing service! Thank you for proofing my poster and catching a huge mistake! I plan to continue to use MakeSigns and will highly recommend you to the rest of my department. Thanks! We offer same-day printing before noon, Rush Service, and Next Day shipping. You're awesome! I was amazed at how fast your service was. I ordered it on Tuesday and received it Thursday (with no extra shipping costs) - I couldn't have gotten it faster locally. And last time I had a poster printed locally it cost about 3x your price! We give you size, material, and shipping suggestions based on your situation and needs. To all: thank you so much for your excellent service. The web site is absolutely the BEST - so clear and helpful. It's logical and well written and is fast and every link actually works. Thank you all again. We have employees answering calls, chats, and emails with personalized help and advice. Great service. Actually it doesn't get any better. I am very pleased with the results and the price was incredibly low. Thanks for the personal touch. Very rare in today's world. 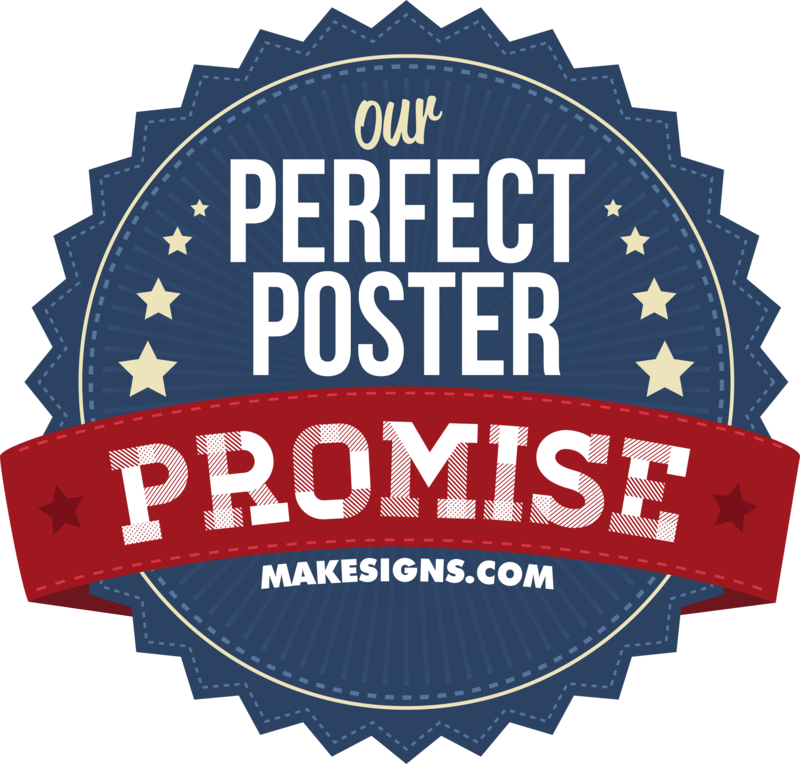 We promise to give you the perfect poster and an experience that exceeds your expectations. If you are not fully satisfied, we will make it right by sending you a new poster or by offering you a complete refund.